Our research focuses on the design, construction, and application of advanced technologies for structural mass spectrometry, in particular, for studies in structural proteomics, systems biology, and biophysics. To identify and structurally characterize biomolecules from complex samples, we perform rapid (µs-ms) two-dimensional gas-phase separations using ion mobility-mass spectrometry (IM-MS) techniques. IM-MS provides separations on the basis of apparent surface area (ion-neutral collision cross section) and mass-to-charge (m/z), respectively. Biomolecular structural information is interpreted by comparing experimentally obtained collision cross-sections in the context of those obtained via molecular dynamics simulations. Figure 1. (A) An illustration of the conformation space separation of different classes of biomolecules. Note that the indicated trends in the correlation function of collision cross section and m/z for particular molecular classes are for qualitative illustration purposes. Structural motifs (secondary structural elements, intramolecular solvation of post-translational modifications, etc.) give rise to deviation from the average correlation function within a particular molecular class. In the analysis of complex biological materials, IM-MS provides a significant advantage over contemporary MS in that the regions in which signals appear in 2D conformation-space correspond with specific molecular class, i.e. the correlation of collision cross section with m/z varies as nucleotides/carbohydrates < peptides/ proteins < lipids/surfactants (Figure 1). 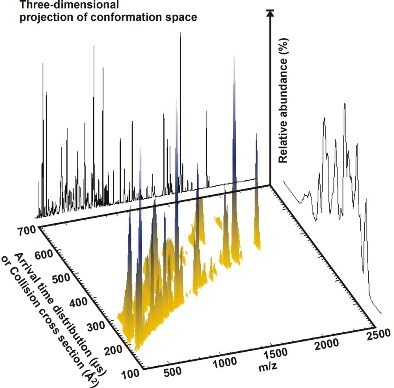 Deviations from where a particular signal is predicted to occur can provide additional information including: (i) identification of sights of post-translational modification, (ii) characterization of secondary, tertiary, and quaternary structural motifs, and (iii) rapid screening for analyte-ligand binding interactions. The separation of analytes on the basis of molecular class provides significant advantages as a proteomics tool, because signals arising from concomitant, non-peptidic, materials are readily separated from the peptides of interest. For example, Figure 2 shows a representative IM-MS plot of conformation-space for an HPLC fraction of an E. Coli whole-cell lysate. Signals arising from surfactant contaminant in the sample preparation are resolved from peptides on the basis of structure and can thus be eliminated when searching peptide m/z signals against proteomic and genomic databases for high-confidence level protein identification. Figure 2. A 3D plot of IM-MS conformation space for a representative E. Coli whole-cell lysate fraction measured by HPLC-MALDI-IM-TOFMS. Two distinct trends of correlated arrival time distribution (which is the observable measured and subsequently transformed to collision-cross section) vs. m/z are obtained corresponding to non-peptidic concomitant species and tryptic peptides, respectively. Importantly, IM-MS can provide detailed structural information for conformational sub-populations of the same analyte (Figure 3), i.e. the relative abundances of different biomolecular conformations can be readily determined. By measuring the change in relative abundance of specific structural conformations as a function of IM separation temperature, thermodynamic and kinetic parameters can also be determined for structural sub-populations, or for structural transitions, respectively (i.e. via van't Hoff or Arrhenius plots). Note that this procedure can also be used to quantify the thermodynamic consequences of stepwise addition of solvent, or small molecules, on the prevailing molecular structure. Figure 3. Experimental IM-MS conformation-space for a model peptide exhibiting two distinct structural sub-populations. Structures obtained by molecular dynamics simulations indicate helical and compact structures consistent with these results. Investigation of the prevailing influences of post-translational modifications (e.g. glycosylation, phosphorylation, ubiquination, sumoylation, etc.) on protein secondary and tertiary structure? Development of imaging IM-MS instrumentation for multidimensional imaging/characterization of biomarker species from thin tissue sections and microarrays. Combining microfluidic separation strategies with IM-MS for fundamental biomolecular characterization in systems biology. Development of selective IM-MS shift reagents for high confidence level identification in proteomics, glycomics, lipidomics, and metabolomics. Development of molecular dynamics strategies for structural interpretation of complementary IM-MS collision cross sections. Construction of advanced laser optical strategies for high-throughput screening of drug-ligand interactions. C&E NEWS- Dr. Michal Kliman (McLean group) featured on the cover of October 10th issue of C&ENews for mass spectrometry and lipidomics"
Rogers M, Sobilik T, Schaffer DK, Samson PC, Johnson AC, Owens P, Codreanu SG, Sherrod SD, McLean JA, Wikswo JP, Richmond A. 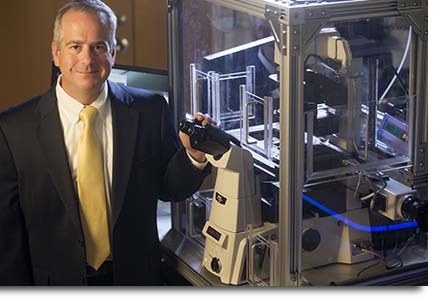 Engineered Microfluidic Bioreactor for Examining the Three-Dimensional Breast Tumor Microenvironment. AIP Biomicrofluidics. 2018,12: 034102. Dodds JN, May JC, McLean JA. Chiral Separation Strategies in Mass Spectrometry: Integration of Chromatography, Electrophoresis, and Gas-Phase Mobility. Chiral Analysis (Second Edition), P. Polavaratu, Ed., Elsevier 2018, 631-646. Nichols CM, May JC, Sherrod SD, McLean JA. Automated Flow Injection Method for the High Precision Determination of Drift Tube Ion Mobility Collision Cross Sections. The Analyst. 2018,143: 1556-1559. Harris RA, May JC, Stinson CA, Xia Y, McLean JA. Determining Double Bond Position in Lipids using Online Ozonolysis Coupled to Liquid Chromatography and Ion Mobility-Mass Spectrometry. Analytical Chemistry. 2018,90 (3): 1915-1924. May JC, Jurneczko E, Stow SM, Kratochvil I, Kalkhof S, McLean JA. Conformational Lanscapes of Ubitiquin, Cytochrome C, and Myoglobin: Uniform Filed Ion Mobility Measurements in Helium and Nitrogen. The International Journal of Mass Spectrometry. 2018,427: 79-90. Dodds JN, May JC, McLean JA. Correlating Resolving Power, Resolution and Collision Cross Section: Unifying Cross-Platform Assessment of Separation Efficiency in Ion Mobility Spectrometry. Analytical Chemistry. 2017,89(22): 12176-12184. Stow SM, Crescenti TM, Forsythe JG, May JC, McLean JA, and Hercules DM. Structural Characterization of Methylenedianaline Regioisomers by Ion Mobility and Mass Spectrometry: III MALDI Spectra of 2-Ring Isomers. Analytical Chemistry. 2017, 89: 9900-9910. Matta P, Sherrod SD, Marasaco CC, Moore DJ, McLean JA, Weitkamo JH. In Utero Exposure to Histological Chroioamnionitis Primes the Exometabolome Profiles of Preterm CD4+ T Lymphocytes. The Journal of Immunology. 2017,199(7). Stow SM, Causon TJ, Zheng X, Kurulugama RT, Mairninger T, May JC, Rennie EE, Baker ES, Smith RD, Mclean JA, Hann S, Fjeldsted JC. An Interlaboratory Evaluation of Drift Tube Ion Mobilty-Mass Spectrometry Collision Cross Section Measurements. Analytical Chemistry. 2017, 89(17): 9048-9055. May JC, Morris CB, McLean JA. Ion Mobility Collision Cross Section Compendium. Analytical Chemistry. 2017, 89(2), 1032-1044.